A Madison Beach Hotel Wedding is set in a luxury hotel that looks out over the Long Island Sound. The hotel resides along the scenic Connecticut shoreline, in the picturesque town of Madison. 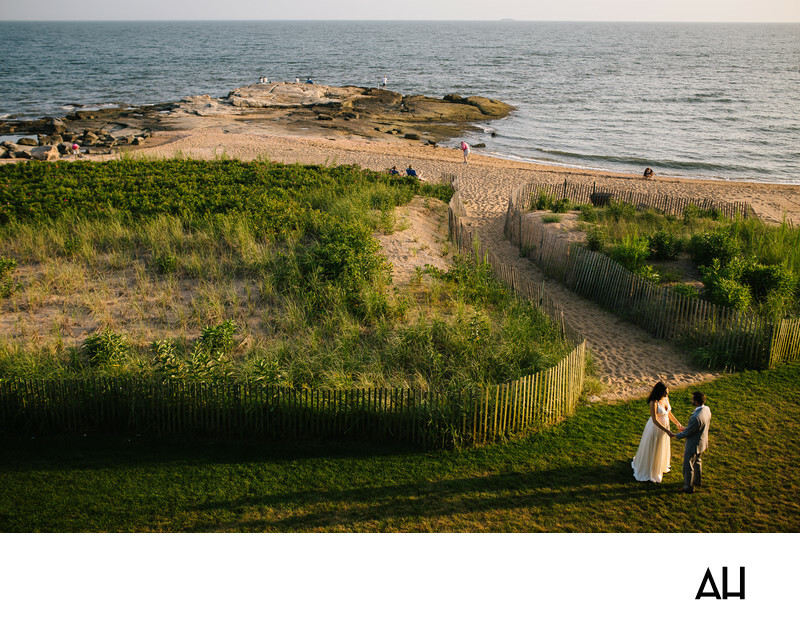 It is a beautiful location for an East Coast wedding. The hotel stands overlooking the water, with a grassy lawn area that leads through low dunes to the private beach front. The vibrant greenery in the dunes and the waves that lazily crawl up the shore and brush against the rocks of the jetty give the scene a natural sense of calm and beauty. In this image I stood above the bride and groom on a balcony to get a view of the pair from up above. This made it feel as though the two were secluded, even though others can be seen wandering the shoreline behind them. The bride and groom notice nothing but each other, holding hands and gazing happily into one another’s face. This picture focuses more on the gorgeous scenery of the grounds, rather than the luxury of the actual venue. The picture captures the sense of peace and lightness that encompassed the day, as the sunlight shines down on the couple and makes it seem that this moment is truly a blessed one.